Welcome to Manister National School. Thank you for taking the time to visit our school website. Our school aims to provide a warm and nurturing environment for pupils to try to achieve their full potential academically, spiritually, physically, socially and emotionally. We strive to be a centre of learning and happiness for all pupils and a source of help and encouragement for all parents. We are extremely proud of our school and community and hope you enjoy your visit to our website! The first legs are appearing on our tadpoles. Their bodies are becoming more defined also. They are about 7 weeks old now and are eating boiled lettuce ravenously. I hope everyone is enjoying this fabulous weather and having a lovely Easter Break. Congratulations again to Alysha and Jamie L on their Easter Raffle wins. Over €300 was raised for the school. All the rubbish you found around and near the school is now out for TLC collection and the gate into the pitch is ready for us to play on the pitch during lunch times after Easter. Please be gentle with it! The Seachtain Na Gaeilge recordings are too big to upload so I'm still working on those. Fingers crossed! 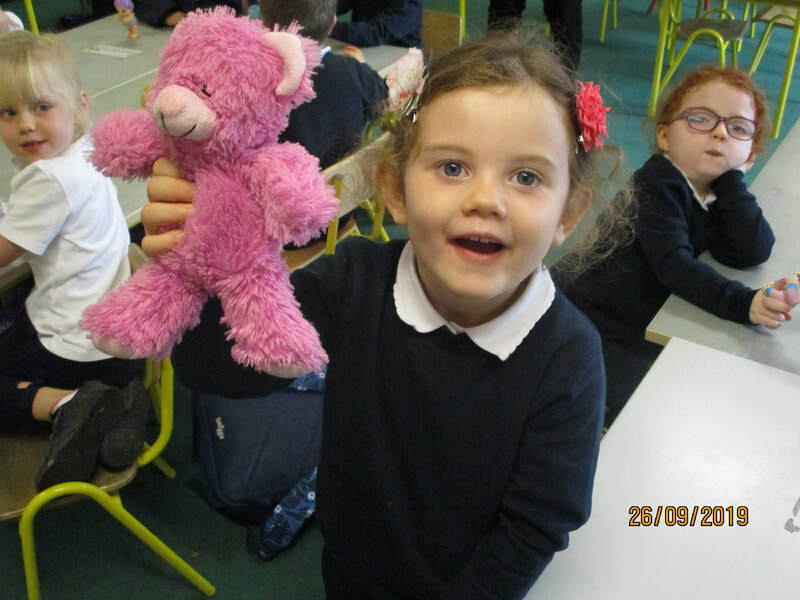 Say hello to our latest pupil who arrived overnight - just in time for Easter. Any suggestions for a name? 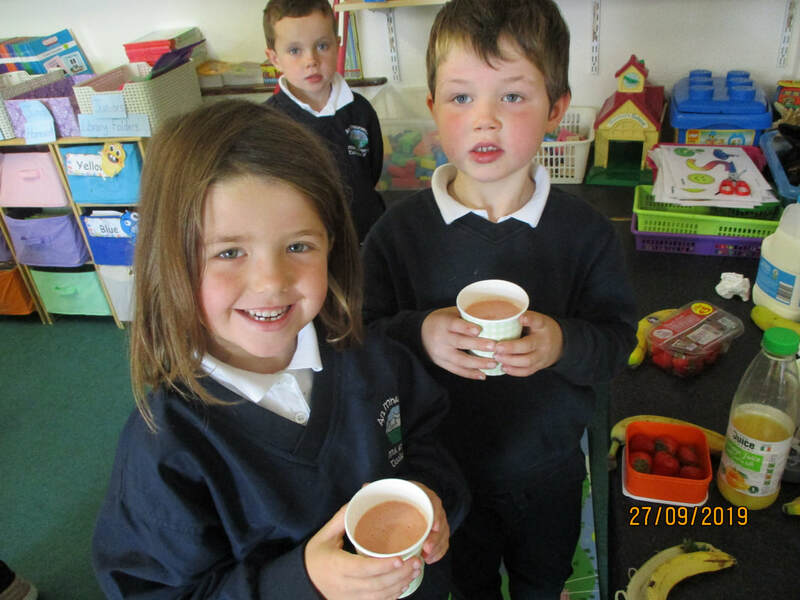 Thanks to Éabha and her dad for the loan of the incubator and eggs. Easter holidays begin tomorrow at 1.40/2.40. The Easter Raffle will take place tomorrow before the Infants go home. Not all book report was recorded before Easter but this will be completed as soon as possible after we return. A text will be sent out tomorrow telling you what is required for swimming which starts on our first day back after the holidays. Those who have yet to pay , please send in money for swimming. 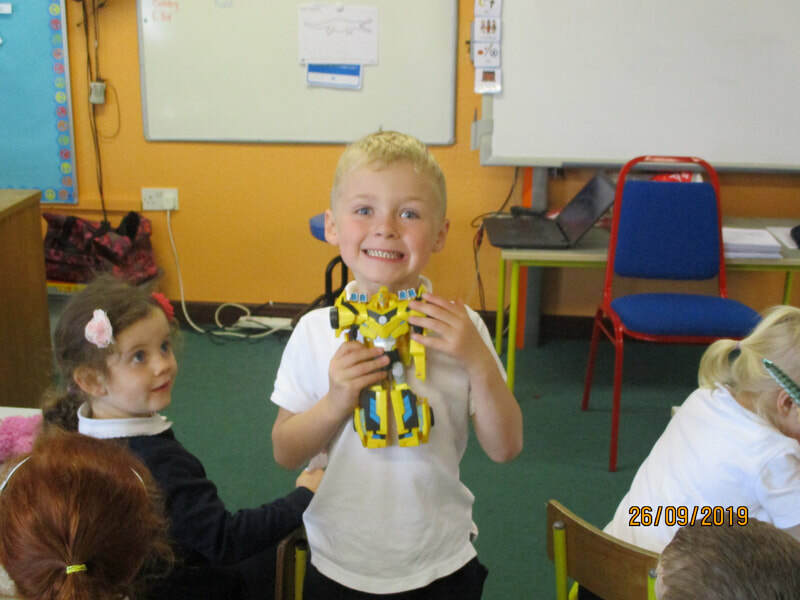 An invitation has been sent out to our incoming infants to visit us in the school on June 21st. A message about 3rd- 6th class school tour will also be sent out tomorrow. Enjoy your Easter Holidays. We will be on the pitch after Easter. Please wear appropriate footwear. Boys from 6th class represented the school very well in the Mackey Cup Trials recently and girls from 6th class are also representing the school in the South Limerick Schools Team after the Eithne Neville Trials. Well done to all involved and thank you to parents who brought them to the trials. We look forward to seeing who will grow faster over the next 6/7 years - infants or the tree they set. See here for some photos. Well done everyone ! Not only did you fill the poster with 300 stickers you even managed to give a few spare stickers to our neighbours who are filling out their poster too ! Pay it forward ! 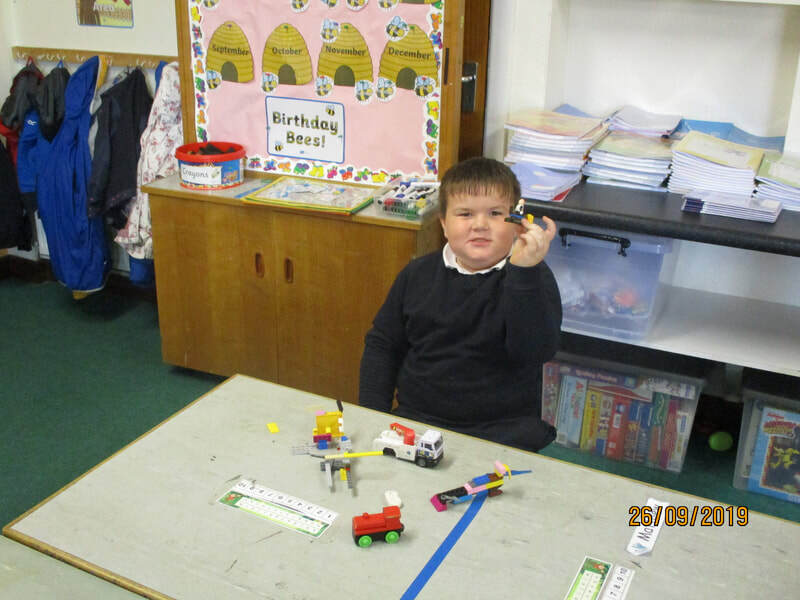 Another busy day at school today. Mr Collins organised a visit from John W Sexton today as part of Poetry Month -Limerick Writers in Schools Programme in Association with Poetry Ireland . These three boys have stuck it out and added 289 stickers to the ALDI Rugby Poster. We sent out a text today asking for the last few stickers and I am delighted to tell you that they have been found ! Thanks to everyone who took part. Thank you to everyone who has brought in ALDI stickers . We are well on our way to finishing the poster. 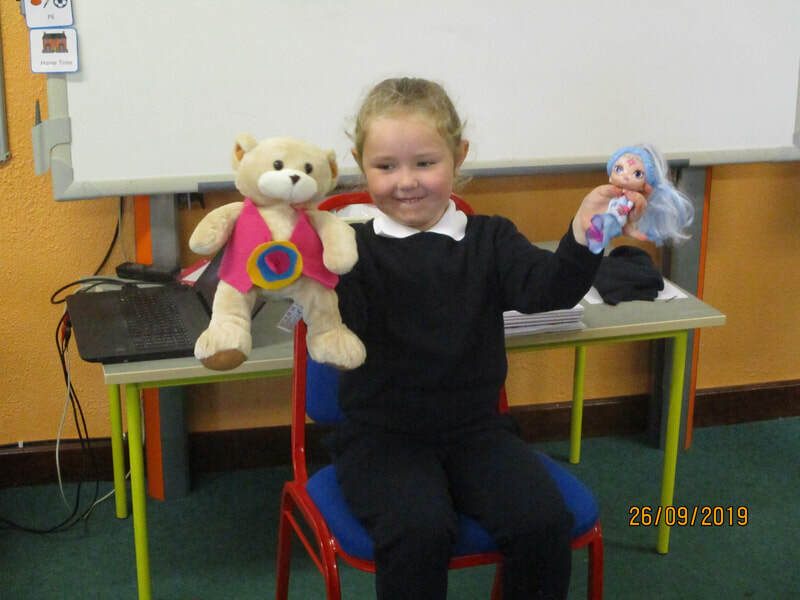 Rosie visited the school last Monday and everyone was interested to meet all of her guests. More photos to follow. Reminder that swimming money ( for 1st to 6th classes) is due to be paid by April 12th. €50 per child . A message has been sent to parents with more than two children going swimming. Swimming begins on the Monday after Easter - Our first day back - April 29th. The Easter Raffle will take place on the day of the holidays - with one hamper for the junior classes - Juniors to second , and one hamper for the middle and senior classes. Both hampers are in the hallway . Lines are €2 each. A text was sent out regarding Infants Tour and 1st/2nd class tours on Friday last . Money for these can be brought in any time between now and June 7th. A text will be sent out about the cost of 3rd - 6th class tours in the next week once it is confirmed. We get our Easter holidays on Friday 12th of April and we finish at our usual time on that day. The Confirmation takes place on May 1st at 1.30 in St Michael's Church - a message was sent out about closing time on that day. Reminder to anyone sending in applications for enrolment to please do so before Friday 29th March . 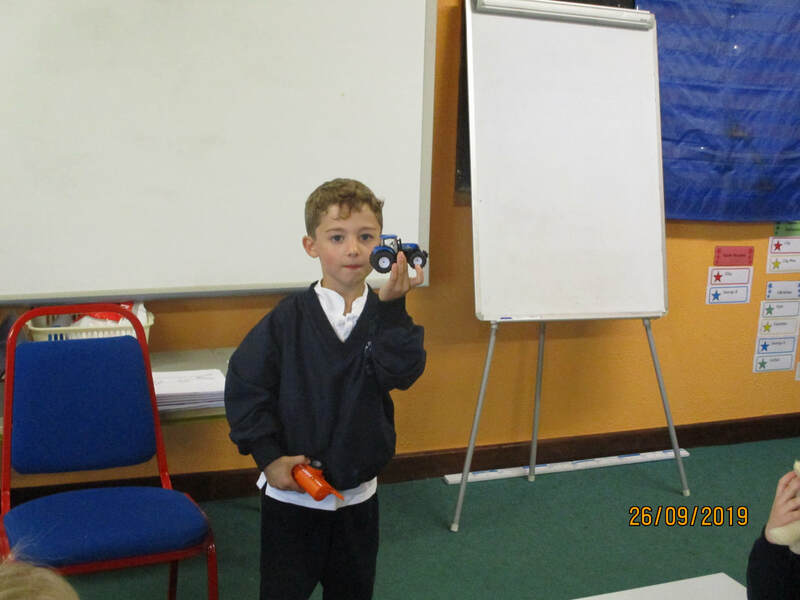 If there are any ALDI rugby stickers at home please bring them in to school asap - three of the boys in 3rd class are looking for more stickers to fill the ALDI poster. Swimming money is due to be paid by April 12th . The cost is €50 per child. Lessons start on our first Monday back at school. Rosie visited us with lots of unusual animals. We got to see and touch (well some of us at least) chinchilla, tarantula, kestrel, milk lizards and bearded lizards. Have a look at some photographs here. 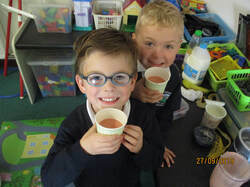 First and second classes were able to get a sample of some frogspawn thanks to one of our pupil''s dad and grandad. We have been learning about the lifecycle of the frog so we were able to witness this amazing story happening right in front of our eyes in our own classroom. You can follow our frogs life story here. We will be in the halla tomorrow at 1 o clock to partake in an event to mark Seachtain na Gaeilge. We hope to have some video clips from tomorrow on the website next week. Wouldn't it be a great achievement if we could have 94 book recommendations from the children of Manister NS before Easter? 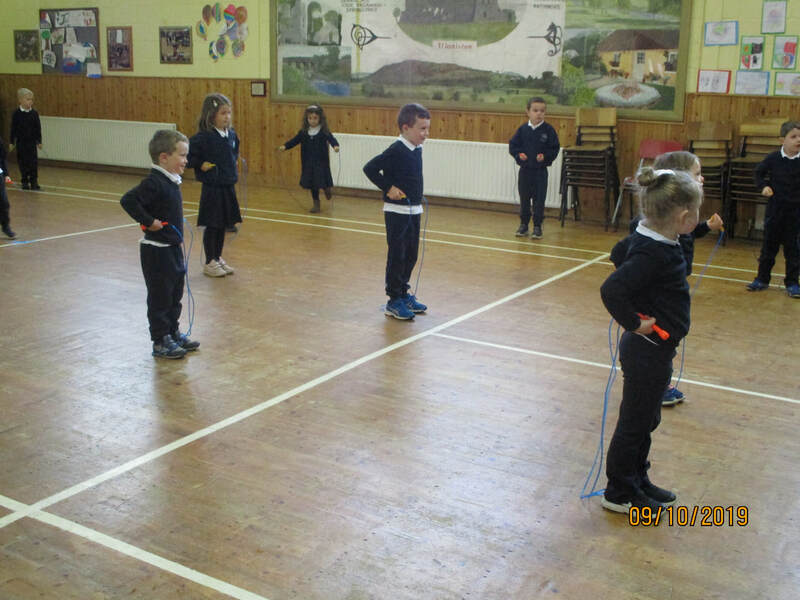 We have started with some 3rd and 4th class pupils and asked some pupils from Seniors, First and Second to partake next week as well. 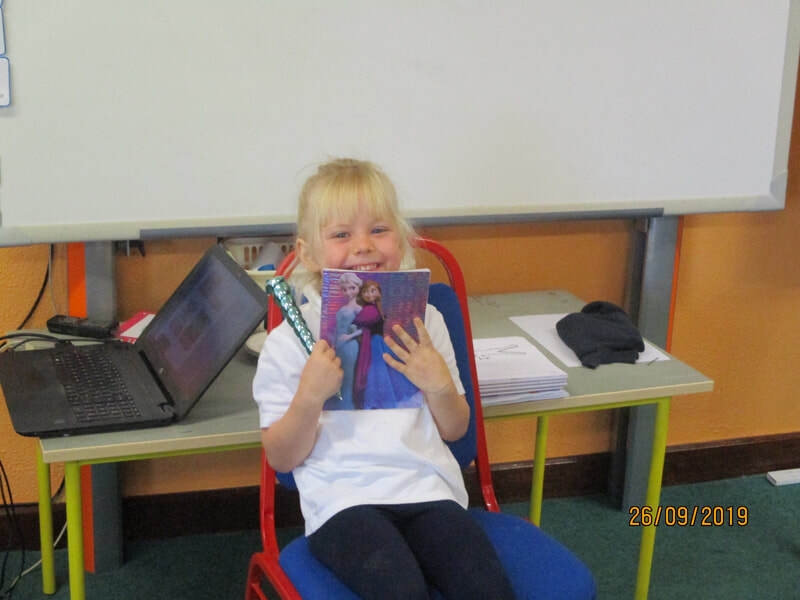 I hope to ask every child to recommend a book they think is worth reading over the next few weeks. Swimming will begin on the first day back after Easter. 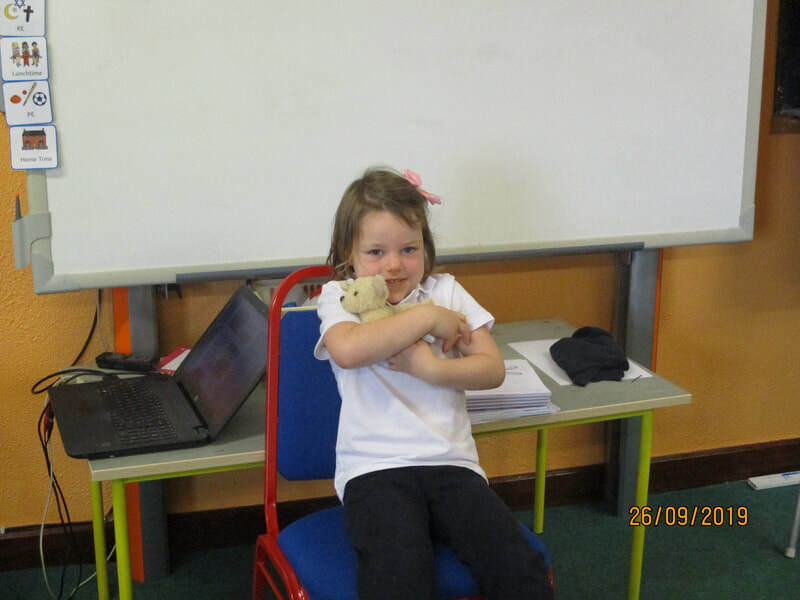 Rosie's Animal Magic will visit the school on March 25th. There will be a small charge to cover the cost of this. A text will be sent regarding this after St Patrick's Day. We will have an Easter Raffle for two Easter Hampers - One for Juniors - 2nd class and a second draw for the older classes. Alice and Ms Fitzgerald will be available to sell lines - €2 per line. This will be a fundraiser for the school and you can buy lines after St Patrick's Day. We hope to be able to share the date and cost of the school tours next week but the venues will remain a surprise until closer to the date! Another reminder that we are closed on Tuesday 19th March. Happy St Patrick's Day everyone! Hopefully the weather won't dampen the celebrations! Some wonderful writing was published in the Limerick Leader last week. 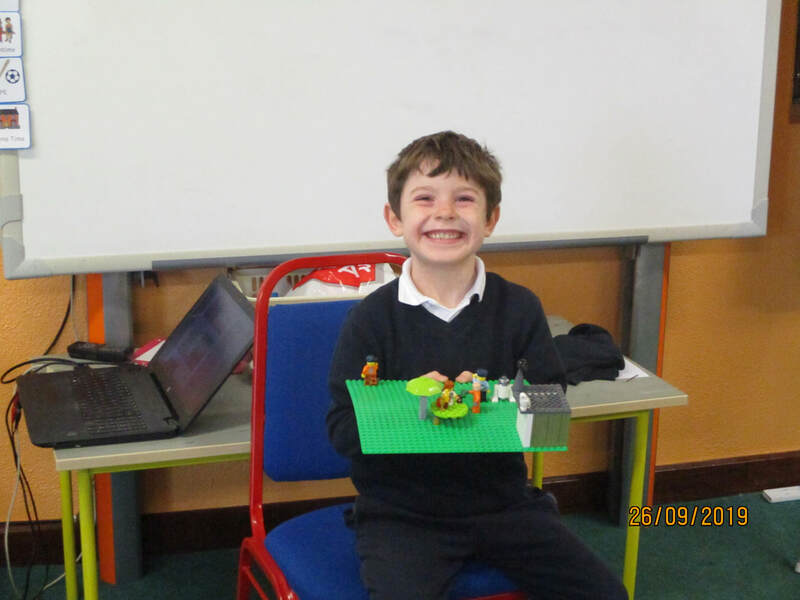 5th and 6th class have been writing reports. 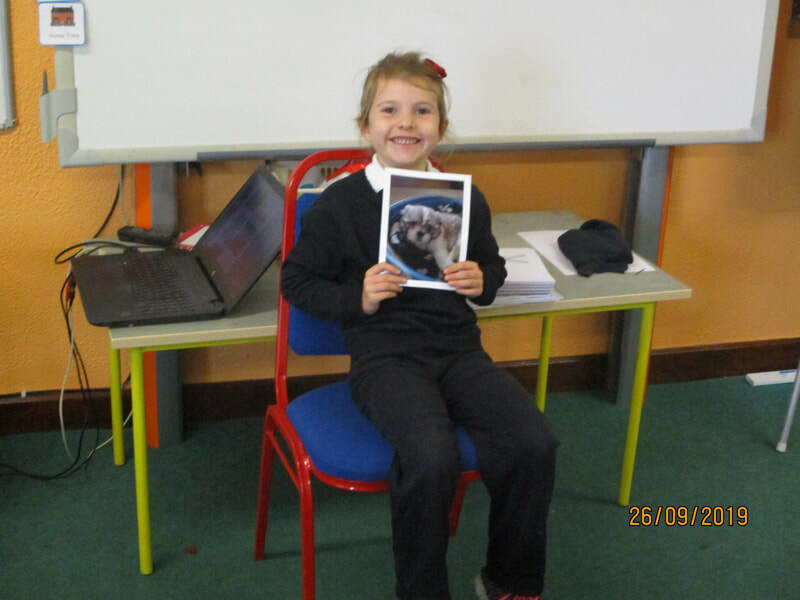 Well done to these writers and their pets who inspired them. 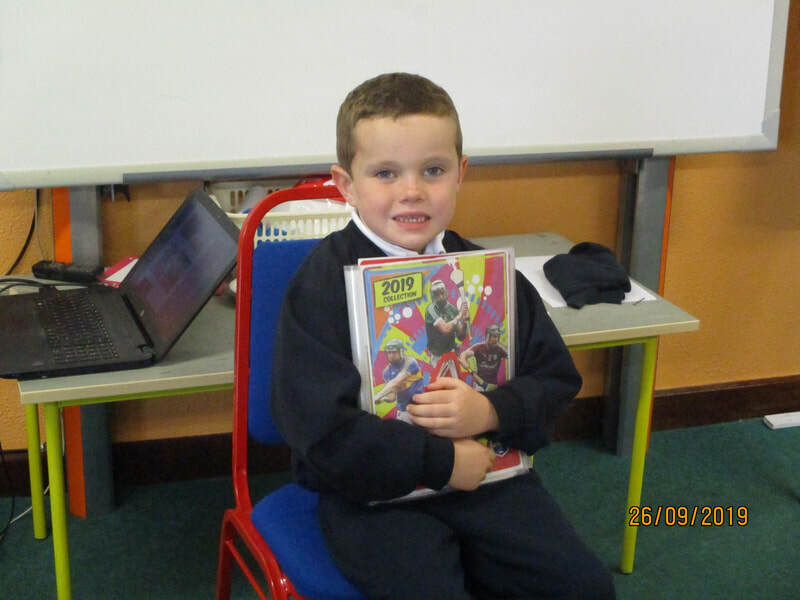 Some pupils from 3rd and 4th class would like to recommend some books. Reminder : Swimming for 1st - 6th class takes place next Term in UL beginning on the first Monday after Easter holidays - This costs €50 per child and can be brought in at any time this term. You are welcome to come to the halla on Friday 15th at 1 o'clock to join us in marking Seachtain na Gaeilge. We will be attending mass tomorrow at 9.30 for Ash Wednesday. We would like to invite any parents/guardians who are available on the afternoon of March 15th to come to the halla between 1-1.40 for a small demonstration/performance for Seachtain na Gaeilge. How do you say hello in Irish???? 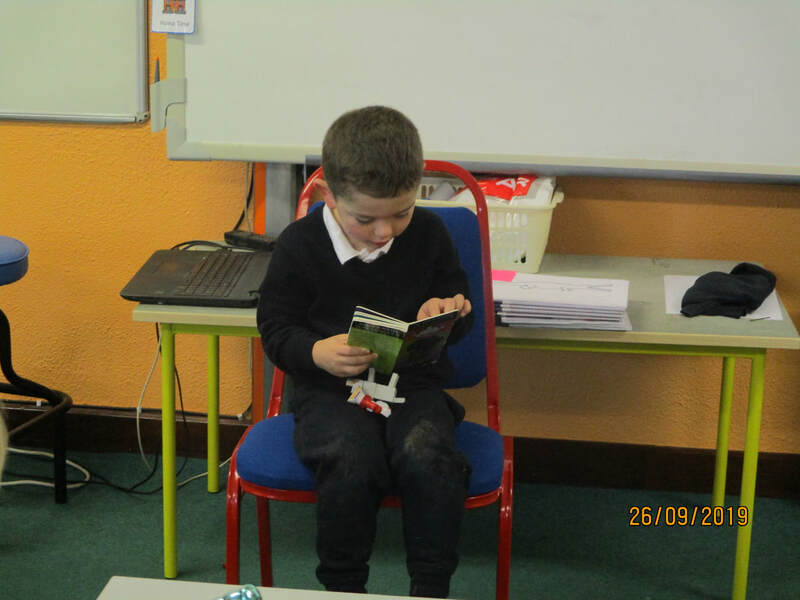 World Book Day takes place on March 7th . This week we will be sending home Book Tokens which can be exchanged for a free book or can be used as €1.50 against any book in participating stores. If you are not using this voucher you can return it to school and we will get a selection of the free books for the library or as class novels but we would encourage you to use these yourself as the free books are well worth a read every year. Thank you to all those who attended our open night , to the staff who helped out and the guest speakers who prepared their own piece to say about the school and spoke so well. Our incoming infants will receive an invitation to visit us in school in June for a few hours to see what the school is like. 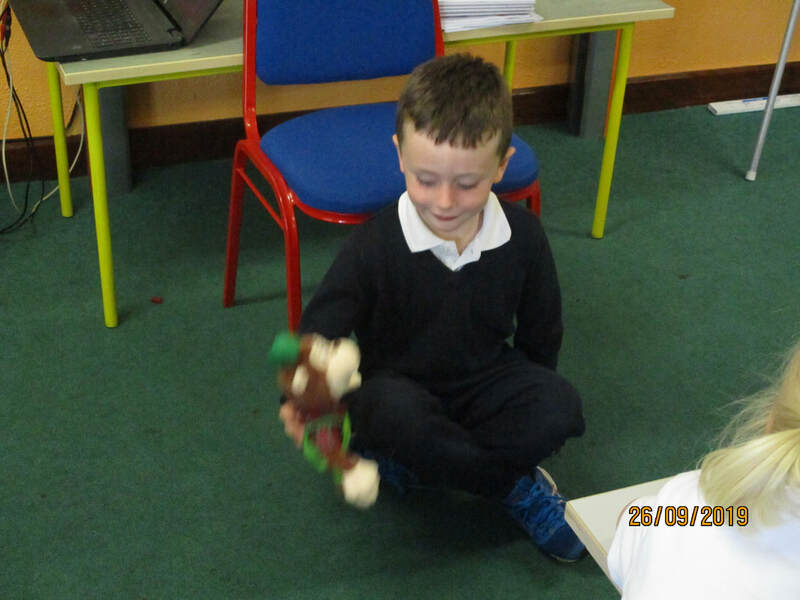 In September , the Junior Infants will finish at 12 for the first two weeks before they start their normal school day which is 9-1.40. We hope everyone has recovered from their various illnesses and are ready to get back to school after the midterm break. For those in 1st - 6th class , a reminder that Swimming takes place in the 3rd term and the cost is €50 per child for lessons and buses. Please note this can be paid at any stage before the Easter break on April 12th and swimming starts on the first Monday back after Easter. We are in the process of finalising school tours at the moment. We will let you know the cost and dates of the individual school tours after Easter but the venues will not be shared until nearer the tours themselves. Thank you to all those who attended and contributed to the School Open Night. In February there is a focus on Online Safety. Last year we had Ger Brick from InetSafety in to speak to parents. Details of his talk can be found in the archives for this time last year. This year , we would like to share some information with you regarding online safety by recommending the platform guide on www.nationalonlinesafety.com . This is not an Irish website but it has fact sheets on various online plarforms such as Fortnite, Snapchat and Youtube and it is well worth looking at. It is also a good opportunity to remind everyone that www.kiddle.co is a search engine from google aimed at children and so the search results will be age appropriate. Seachtain na Gaeilge will commence on March 1st . 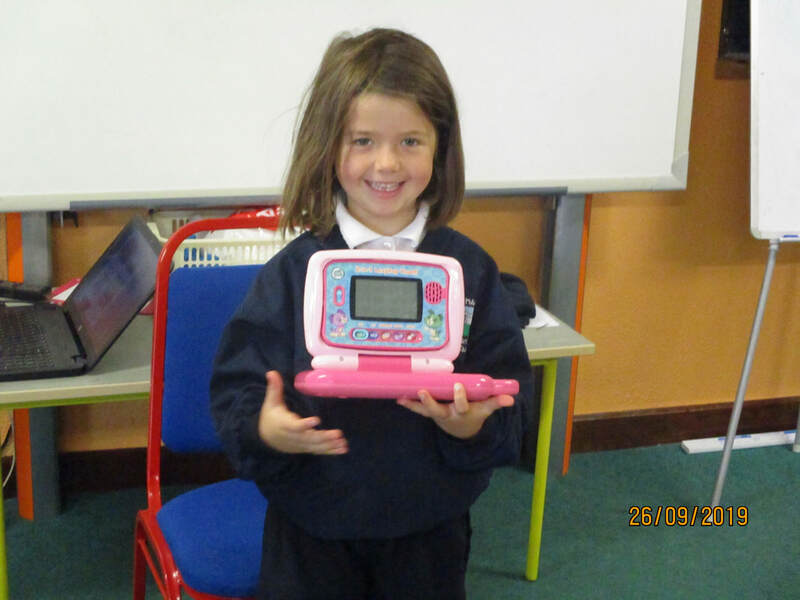 We hope to upload some phrases recorded in 3rd and 4th class to help you learn for the first time or revise your own Gaeilge. Various young writers from 1st - 6th classes hope to be published in The Limerick Leader again soon. We will let you know when they are in the paper. We had no entries from the school for the Community Games Talent Competition but Manister is well represented in other competitions. Well done to those who have participated. Open Night takes place from 7 - 8 on Tuesday February 19th in the school. Please find below details of an email we received from Community games. If there is anyone / team interested in registering for any of these competitions please let the school know by the end of the week and we can pass on your details to the organiser. Reminder : Midterm Break takes place on Thursday 21st and Friday 22nd of February. Get well soon to all those who are sick at the moment. 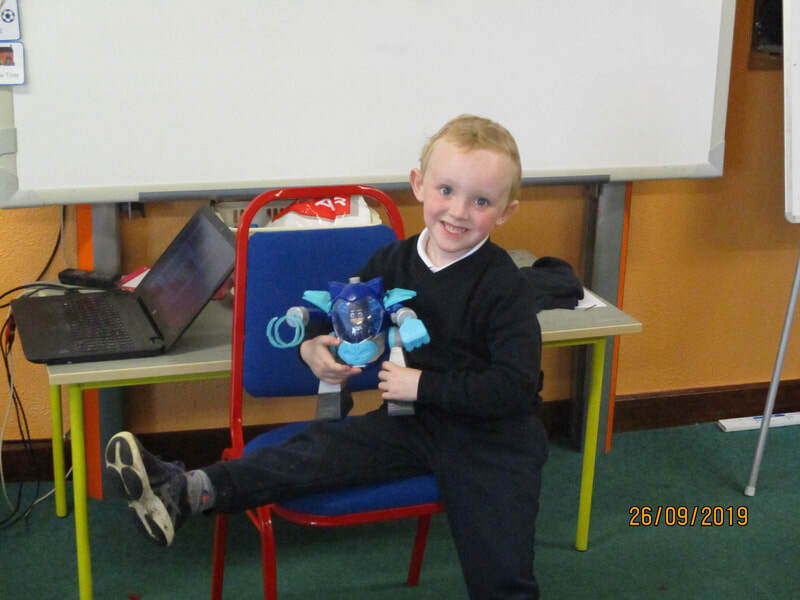 Today we had Geoff Hunt in the school to talk to the children about Biodiversity . We look forward to taking his ideas on board and becoming more familiar with our natural surroundings. Today is officially the first day of Spring. We hope everyone is wrapped up and staying warm. In December a lot of the previous months Newsletters surfaced in pupils folders and at the bottom of bags. 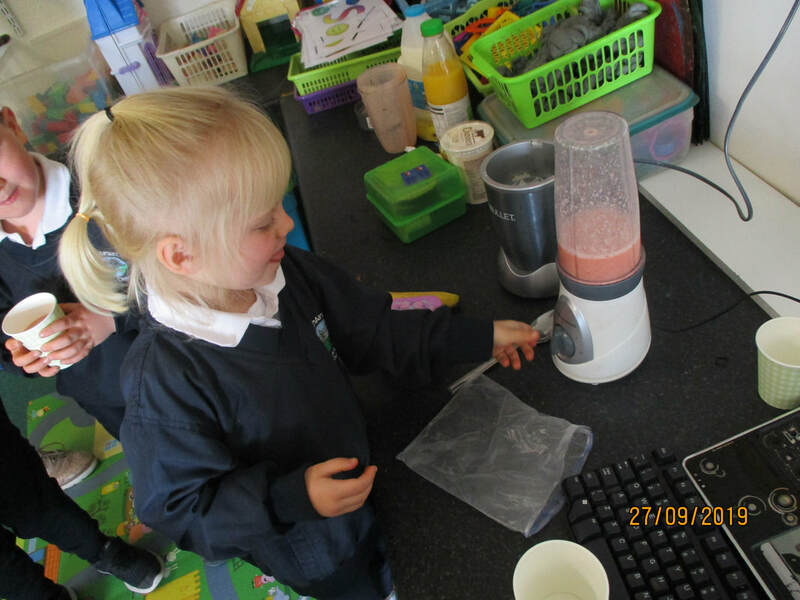 Posting the Newsletter on the website allows all parents to have access to the same information. On St Brigid's Day we will attend mass at 9.30 in Manister Church. All are welcome to attend. Parent /Teacher meetings are now over for another year. If you were unable to make the meeting or would like to make an appointment to meet with a teacher please contact them either by email at manister.ns@hotmail.com or 061397220. Grandparents Day took place on January 30th as part of Catholic Schools Week. Although everyone was involved in Catholic Schools week , this year was the year that 3rd - 6th class invited their grandparents to our prayer service. Next year will be the turn of Juniors - 2nd class. Swimming will take place on six Mondays in the third term in the University of Limerick for 1st - 6th classes. 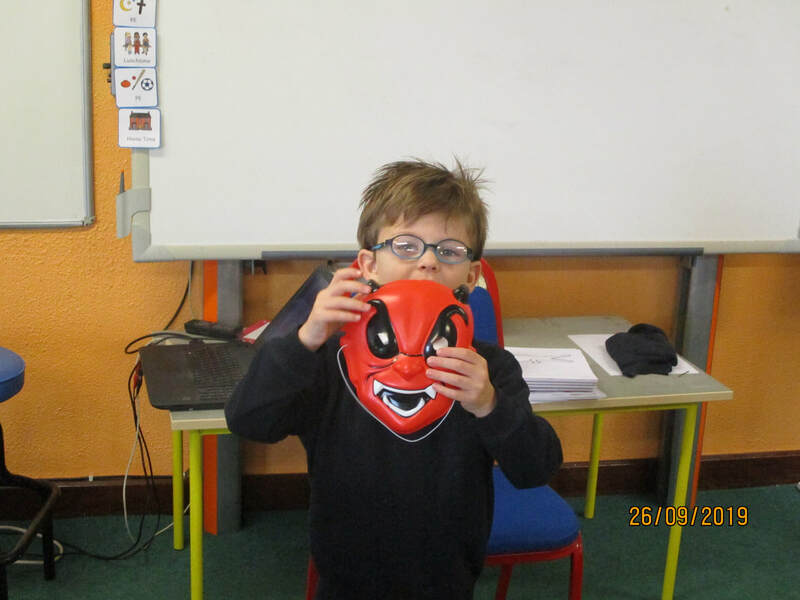 Lessons and buses have been arranged and the cost is €50.00 per child. This can be paid at any time this term. 3rd-6th class have now brought home their invitations for Grandparent's Day on January 30th from 2-2.40 in the school. These boys are lucky to have a Grandmother who paints personalised paintings for them. Well done to our 6th class camógie players who were part of the Crecora team which won the Mackey A Championship Plate recently. Our parent /teacher meetings are taking place this week on Wednesday and Thursday. 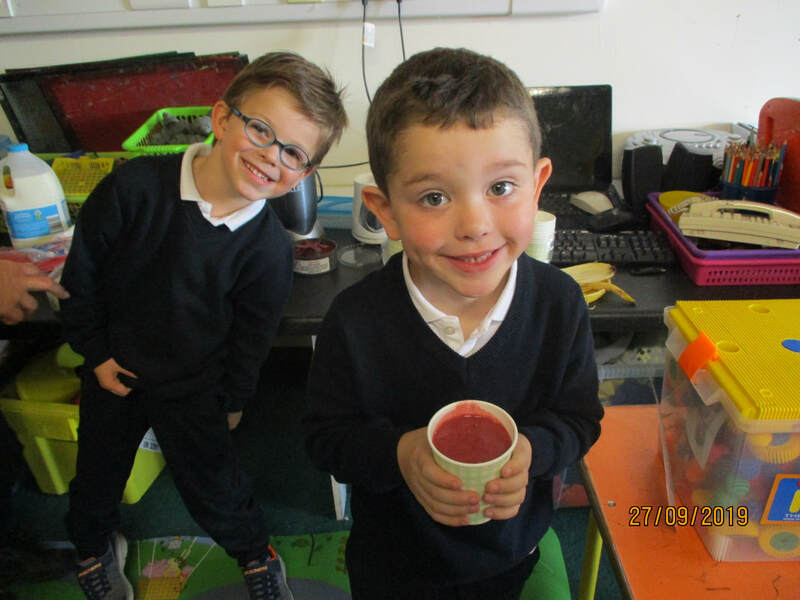 On February 19th this year between 7pm and 8pm we would like to invite parents who are interested in enrolling their children in Manister National School for September 2019 to our open night which will take place in the school. 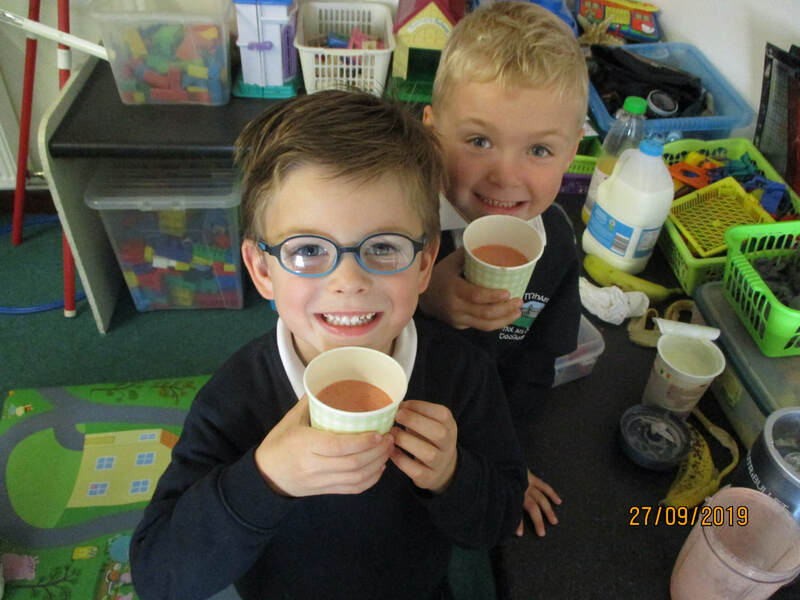 The children who will be starting in September will be invited to visit the school from 10-12 on a morning in June. Well done to everyone who took part in recent Community Games activites - Table Quiz, Art and Handwriting Competitions. Anna, Sophia, Chris, Amy, Niamh and your parents who brought you all to the events. Catholic Schools Week is from 28th January - 1st February. Grandparents Day will be celebrated in the school and this year it is the turn of 3rd - 6th class to invite their grandparents. They will send an invitation home this week and the date and time will be in the January Newsletter. We will be going to mass on St Brigids Day ( February 1st ) and will be bringing our St Brigid's Crosses to be blessed. If anyone has rushes which can be used to make the crosses we would be delighted to get them for the older classes. In order to help reduce our paper usage to maintain our Green Flag the Monthly Note will be put up as a link here for the rest of the year instead of printing them. Reminder that we close early to facilitate a staff meeting. School will finish at 12.30. Parent Teacher meetings are next week on the 23rd for surnames A- L and 24th for the remaining surnames. Thank you to all involved in carol singing - a total of €1285 was raised on the day and this will be divided between The Bumbleance and Cenacalo House in Knock. Thanks to everyone who helped out. Good luck to all those taking part in the community games at the moment. We will have an update next week regarding Grandparents Day, St Brigids mass and other activities which will take place this term. Welcome back & Happy New Year. Reminders : School will close at 12.30 on January 17th to facilitate a staff meeting. Parent Teacher meetings will take place on the evenings of Wed January 23rd ( surnames A-L) Thurs 24th of January ( Surnames M +) between 3- 5pm in individual classrooms. A text/letter was sent home regarding Community Games this Saturday morning January 12th between 10-12 where an open art competition and a handwriting competition will take place. These are organised for those Under 8 and upwards. Swimming and buses for 1st to 6th classes are booked for the following six Mondays - April 29th, May 13th, May 20th, May 27th, June 10th and June 17th. We have the 12 to 1pm slot in UL. Bus will leave approx 11:10am and return to the school at approx 1:50pm. We will notify you of the cost later this month which will be due at the end of the term. Today is the last day of the school holidays as well as Nollaig na mBan and The Feast of the Epiphany. We will see you back at school tomorrow morning for the first day of school in 2019 . Congratulations to all involved in the Classic Club Tractor Run and to Pat Morrissey. There is a lovely piece in The Limerick Leader today written by Dónal O Reagan. Happy Christmas on the shortest day of the year and Best Wishes for 2019. Enjoy your Christmas holidays. We are back to school on January 7th. We will close at 12.30 on January 17th to facilitate a staff meeting. Parent Teacher meetings will take place on the evenings of Wednesday January 23rd for all those with surnames A-L and on Thursday 24th of January for all remaining surnames. These take place between 3- 5 in individual classrooms. Well done and Thank you to all those who helped with Carol singing in the Crescent on December 20th. Singers, Musicians, Parents, Grandparents, Aunts, Grandaunts all helped us raise money for Cenacalo House in Knock and The Bumbleance. Mannings bus brought us in to the Crescent and Tina Keyes and her students provided the accompaniment. Thanks to the all those who brought in chairs, shook the buckets and managed to load up all of the chairs again at the end and deliver them back to the school. We all really appreciate your help and support. We will update you on the amount raised as soon as we can. Today, three lovely singers sang at mass at Communion time and everyone joined in for our two other songs. We have heard rehearsals for the Parish Children's mass are going really well and hope you all enjoy it. Have a lovely break and we will see you back at school on January 7th. Merry Christmas ! A reminder that Christmas Holidays begin at 12 noon on Friday 21st December. We will attend mass as a school that morning. December note will be sent out this week. "Thanks to a very persuasive letter from Daithi and Emma , Mannings Bus have agreed to take us in to Carol Singing on Thursday 20th.Pupils will be finished&ready for collection at 5pm in the middle of the Shopping Centre -opposite Butlers Cafe.Come to school in Christmas Jumpers etc , bring school bags which can be left in school overnight.Short break during the carol singing to go to the shop etc. Thanks as always for your support"
Some of the children from 3rd- 6th will be Carol singing in the Crescent shopping Centre from 2-5 and would love your support. To all those recovering from Chicken Pox - Get Well Soon! Christmas Cards were sent home last week.Next week when the December Newsletter goes out we will tell you the total amount raised. Parent Teacher dates will be confirmed in that later also. For those who have not been here for P/T meetings before , the school is divided alphabetically over two days. If you do not have a second ( or third) teacher to visit individual teachers may contact you to arrange an alternative day to help alleviate waiting time on those two days. 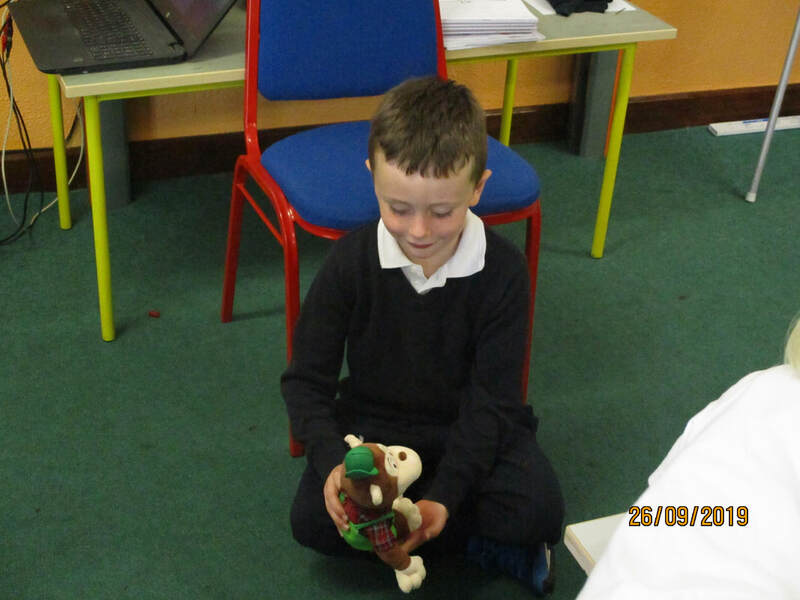 We will finish at 12 noon on Friday 21st and we hope to go to mass that morning as a school. Feel free to wear your Christmas Jumpers or Christmas colours that day to enhance the festive feeling. We will not be collecting money for charity on this occasion - it is just for fun ! A big congratulations to the 12 pupils across who received their Mangahigh medals today for achieving over 150 points on Mangahigh during the recent National Maths Week. Reminder to bring in Heinz Beans wrappers for the school if you have them! So far , we have a grand total of .....one wrapper! As you know we have until February to collect them but the number we get before Christmas will give us an indicator if we will be able to place an order. 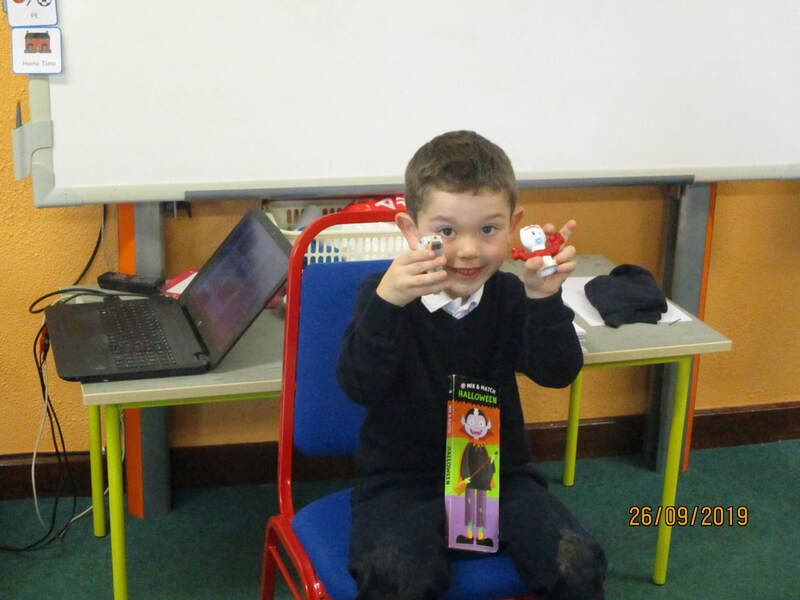 Third and Fourth class are looking for your help - in the form of buttons! We would like to make some Christmas Decorations and a variety of buttons would help make them different and individual. If you have any spare buttons at home we would appreciate a donation. The boys from 3rd and 4th Classes attended a Futsal tournament today. Futsal is a derivation of soccer. It is 1 5-a-side game with a smaller softer ball and the focus is on passing the ball. We played 4 games and won three of them. 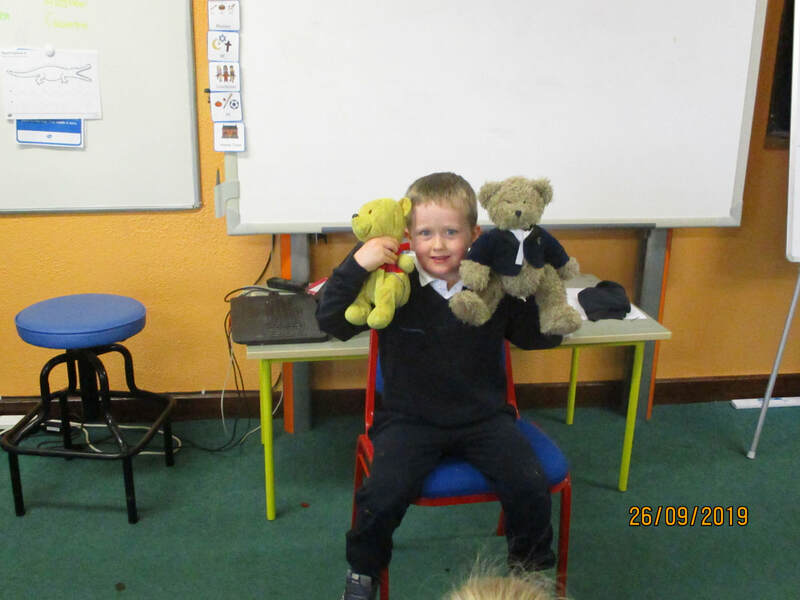 Well done to the boys who behaved themselves brilliantly and did the school proud. Some photos here. Thank you to everyone who brought in Christmas Shoeboxes -A total of 68 Christmas Shoeboxes have been sent to Team Hope. Some things are worth the wait ! You have waited since September 15th for these photos - I hope you enjoying looking back on the Laurel Hill Blitz in Na Piarsigh. Please ensure that all pupils bring a jacket/coat to school as showers can come without warning while we are on the yard. If it rains while we are outside all children must go straight into the shed until the shower passes. Thanks to Áine Ní Fhlartha from The Sustainable Energy Authority of Ireland (SEIA) who visited our school today. Áine gave a workshop for 1st/2nd and 5th/6th Classes. 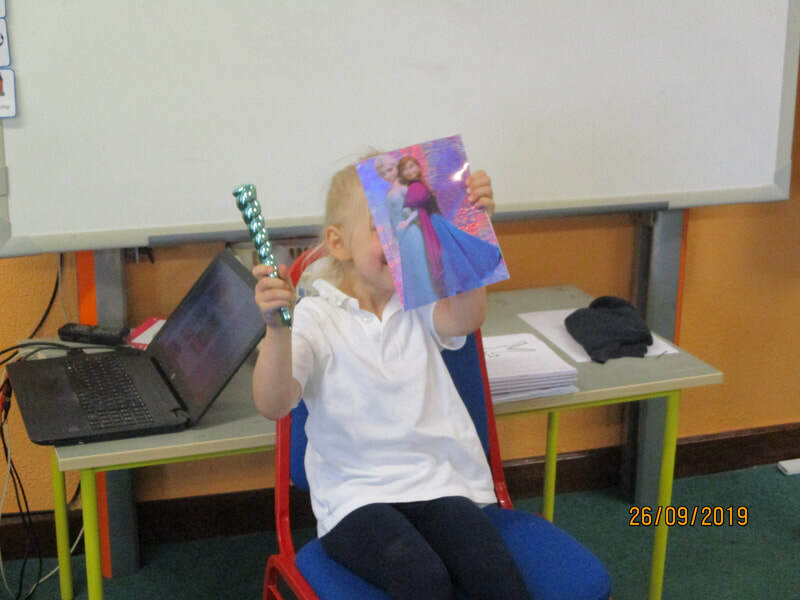 During these workshops we learnt about sources of energy and the importance of conserving energy in our school and homes and helping protect our environment in the process. ​You can find further information on the activities we took part in and some photos here. ​Another monstrous effort by everyone this Hallowe'en. Best year ever for the costumes. Well done - especially to the "home-made" outfits which were truly brilliant. Check out the photos here to see which is your favourite? 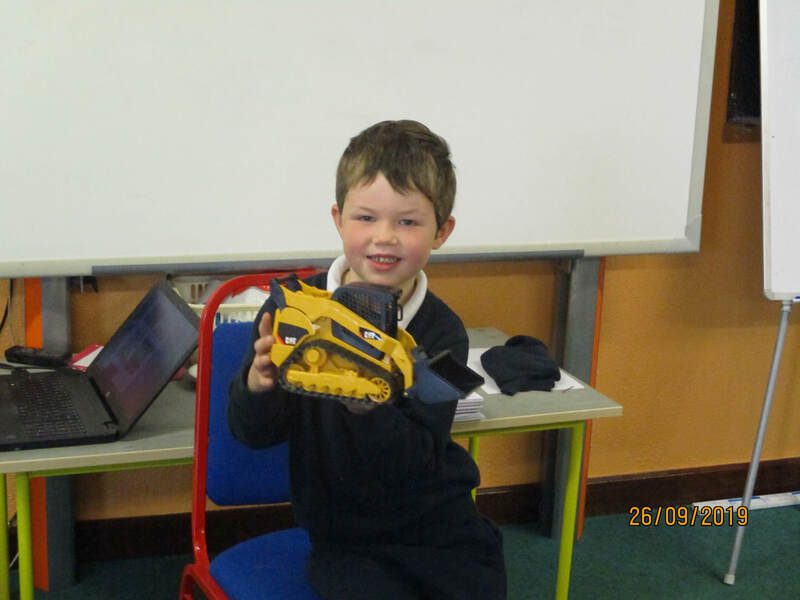 Finally got to put up the photos from the visit of Liam McCarthy the school - sure we were just waiting until we could say thank you to All-Star Seán Finn for taking the time out to bring Liam to the school. ​Photos from the day can be found here. Thank you to everyone who contributed to our collection for Barnardos today. A total of of €148.50 was raised. Our gigantic cheque was already written before we received some extra contributions at the end of the school day. Enjoy your midterm break. We will see you all on Monday November 5th for the second half of our term. Your sample Christmas cards will be sent home after midterm break and all details explaining how to order them etc will be given to you then. Christmas Annual Forms need to be returned by Tuesday November 6th if you wish to order one. They cannot be accepted after this time. 1st and 2nd class and 5th and 6th class will be taking part in Energy Workshops on Tuesday November 6th to help us towards earning our second green flag. A note will be sent out regarding Carol Singing during our first week back. We hope to have someone in the school office after midterm break and will update you once this has been confirmed. A reminder to those who have yet to pay for book rental etc to please contact the school. A note is required when a pupil has been out of school for any reason. Class begins at 9am. The door to the school is locked at this time and from then on anyone entering the school during school hours must ring the doorbell at the door near the office/facing this pitch and be let in by a member of staff for Child Safeguarding reasons. Please ensure that pupils arrive in time for school in order to avoid disruption. Thank you. 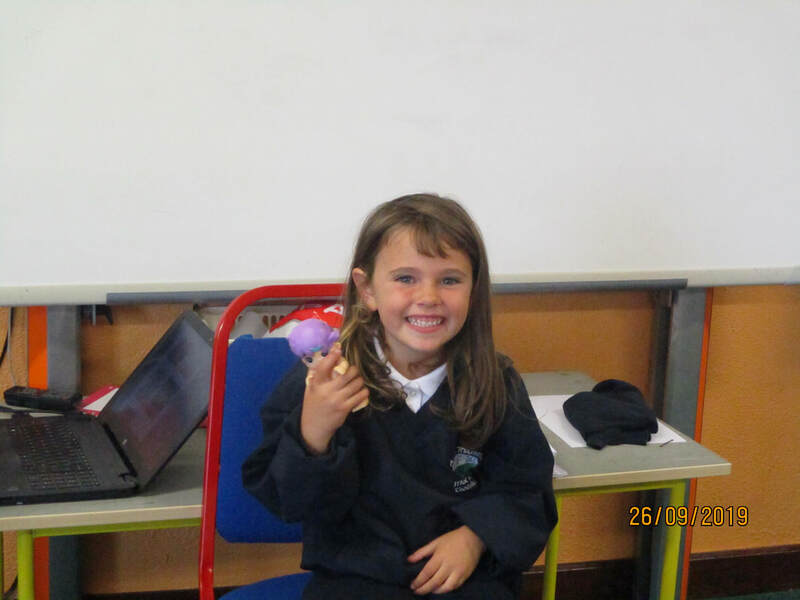 A huge well done to all who participated in Mangahigh during maths week. Last year we had 9 pupils who reached the 150 points mark. This year we had 12 so well done to those pupils. You will be receiving your medals soon. Some huge scores were notched up but we have got to give Jack and Dylan a special mention for achieving a phenomenal scores of 558 and 309 points. Do they have to get two medals? In total, Manister pupils spent 111 hours practicing their maths on Mangahigh during maths week and a total of 1421 activities were tackled. This can only help with your mental maths abilities in the future. Remember that you can practice on Mangahigh at any time. As per school note Midterm Break starts this Friday. Sixth Class have chosen Barnardos as the charity we will collect for this year. A donation of €2 per child has been suggested. The Team Hope Shoe Box appeal information has also been sent home. A form for Christmas annuals will also be sent home next week. If you wish to purchase an annual, please return the form after Halloween break in an envelope with the name and class clearly written on the form. To avoid confusion with Barnardos Collection please do not return these before Halloween. Heinz Beans tokens can be collected from now until February and sent in to the school to be in with a chance to order training gear for the school. For further information please visit heinz.ie/teamz. If we are able to partake in this we would be delighted to get more PE equipment for the school. Schemes like this often favour schools with larger numbers but we have plenty of time and we will update you before Christmas regarding progress. We appreciate your support. A note regarding Carol Singing will also be sent out after Halloween. This year we will be limiting it to pupils from 3rd - 6th class as we were unable to get our usual time slot. We appreciate your help every year as we team up with Tina Keyes from Crecora and her guitar students for carol singing in The Crescent Shopping Centre to raise money for two charities ; Cenacalo House in Knock and The Bumbleance. www.cenacolocommunity.ie and www.bumbleance.com for further details on these charities. You can read the latest school note here. Maths Week begins this Saturday and we will be focusing in particular on Maths in the world around us over the next week. All pupils from 1st to 6th have been given User IDs and passwords to Mangahigh. There is a huge range of challenging fun activities on the site for which you can collect points. Anyone reaching 150 points gets a fabulous medal. Log in to www.mangahigh.com/en-gb/ using your User ID and password, go to Browse All Activities and select from hundreds of activities. Some people follow their team on TV. Some people support their team by going to their matches. But these two soccer mad supporters showed the ultimate support by going to watch their team train. They got to meet lots of the players on the Irish Senior Mens Internationa team. They got their jerseys signed by pretty much the whole squad. The got their photo taken with many of the squad, including Cyrus Christie, Jeff Hendrick and even Roy Keane. They even featured in an article in The Examiner. Enjoy the game this Saturday boys and sure maybe one day you'll wear the green jersey themselves. COYBIG. Well done to the girls who represented the school today in Na Piarsigh in a camogie blitz organised by Laurel Hill FCJ. They played very well and showed themselves to be great sports people. Thank you to Maeve's mom and Niamh's dad for all of their help, to Mr Linnane and Mr Collins and all the parents and siblings who came to support the team. There were 11 brilliant players and they brought a brilliant team with them as well- Well done to all involved! Photos to follow. Reminder : School finishes at 12 noon on Friday 14th of September to facilitate a staff meeting as per text message. 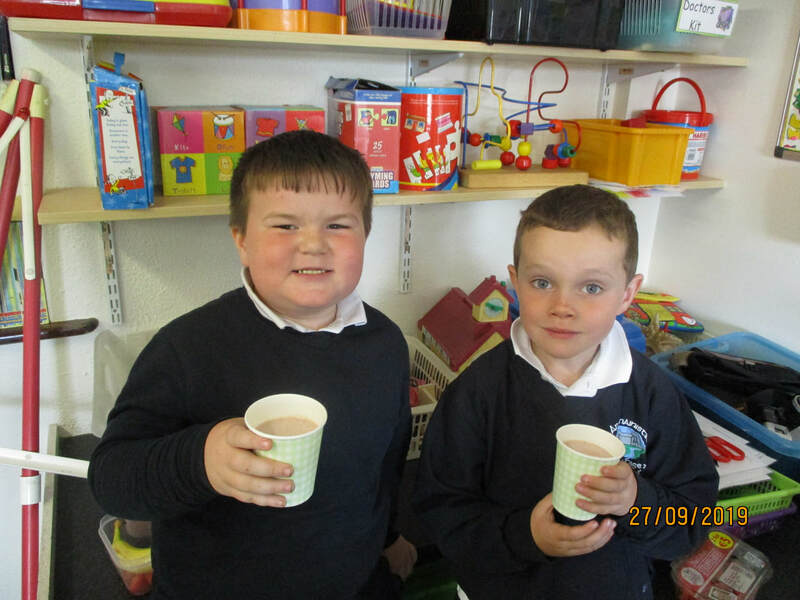 Seán Finn and Noel Hartigan brought the cup to school today . 'Limerick you are a Lady' was sung, photos were taken and autographs obtained. It was a very busy and fast visit but representation from the Manister/Crecora Club and bunting and flags borrowed from Pauline's house all added to the sense of occasion. Photos to follow. The girls from 4th, 5th and 6th who are partaking in the Camogie blitz on Saturday will meet in Na Piarsigh - the blitz starts at 12 and they are hoping to be finished by 3.30. This is run by Laurel Hill FCJ. 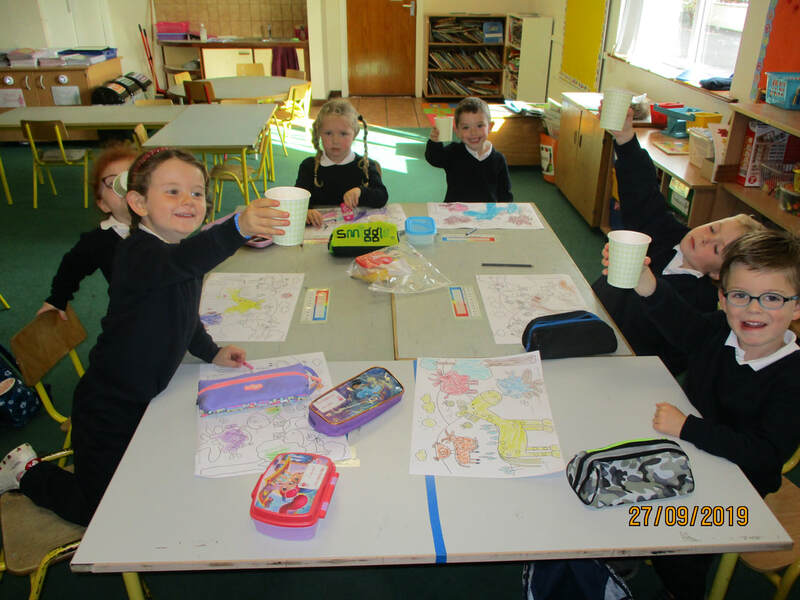 1st and 2nd Classes have been celebrating Limerick's fantastic win by decorating their own Liam McCarthy cups. Congratulations to this bunch of budding artists who won awards at the Limerick Show Children's Art competition last weekend. We are looking forward to seeing you all back at school tomorrow at our new starting time of 9 o'clock. Access to school grounds is from 8.50am. 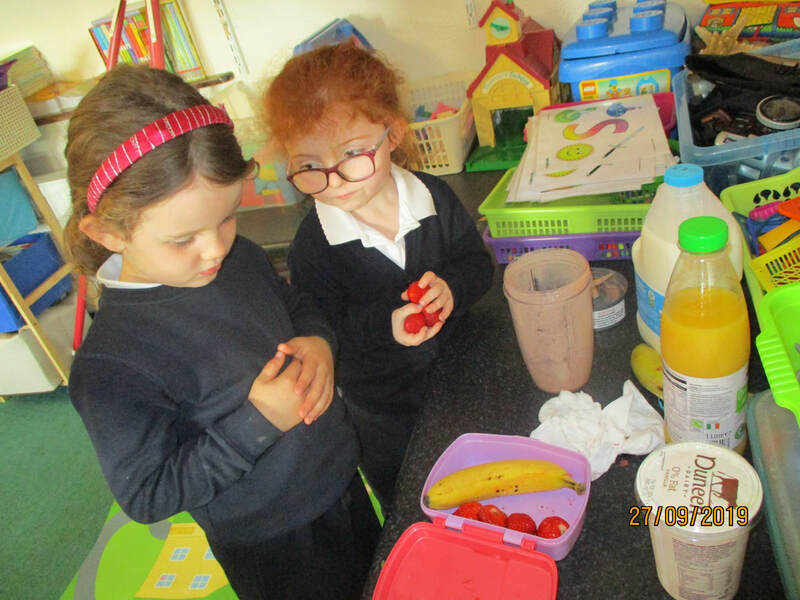 Pupils are to go straight into their classrooms as there is no playtime before school. As we are temporarily without a secretary please contact the school by email if you need to(manister.ns@hotmail.com) instead of ringing as we will all be teaching. We will update you when a new secretary has been appointed. Enjoy your last week of holidays ! Staff Update : Mr Musgrave is now a permanent member of staff at Manister National School. Mr Collins will be teaching 5th/6th class and Mr Linnane will be teaching Infants. What a week for Limerick Hurling ! Hopefully everyone is still celebrating the huge success ! Reminder : With effect from August 31st classes at Manister National School will begin at 9am and school will end at 1.40 pm for Junior and Senior Infants and 9am to 2.40pm for 1st - 6th class. Children will be supervised in their own classrooms from 8.50am . No responsibility is accepted for pupils arriving before that time. Classes will commence each day at 9.00am. Entry to the school yard from 8.50am when the bell rings. 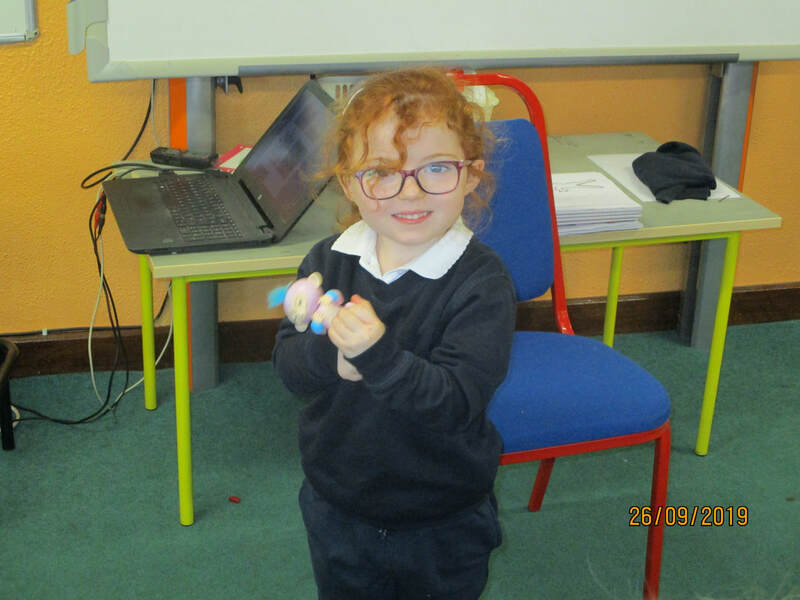 Junior Infants who start school in September 2018 will finish at 12 noon from August 31st to Friday September 14th incl. They will finish school at 1.40pm from Monday September 17th 2018.